The percussive-based 1996 set finds the world-fusion group fashioning thematic songs around rhythmic structures and tribal beats, creating atmospheric soundscapes that take the listener through Africa, South America, England, and Europe—sometimes within the same movement. Blurring the lines between styles and genres so that they become irrelevant, Dead Can Dance members Lisa Gerrard and Gerald Perry generate the illusion of being lost amidst a peaceful rain forest that’s yet to be discovered by man. Spiritchaser is the sound of a lost culture, where ethereal singing, overlapping harmonies, and trance-like tempos serve to calm, relax, and enchant. Gerrard’s phonetic singing—often taking the form of prayer—is grand albeit understated, as much spiritual as it is natural. Just like the music itself. Exotic instrumentation abounds, but nothing seems out of place. A Turkish clarinet, finger cymbals, and a borrowed melody from the Beatles’ “Within You Without You” informs the mystery of tracks such as “Niereka,” which epitomizes Dead Can Dance’s incomparable blend of ancient and modern, alien and familiar, spooky and freeing, serene and intense. Throughout,Spiritchaser strives for a transcendental sense in which music speaks to a higher power and greater purpose than most artists would like to believe—or dare capture. Dead Can Dance’s ambition extended to the production. Watts-Russell’s observations can be experienced first-hand like never before on Silver Series' numbered limited-edition 2LP set. 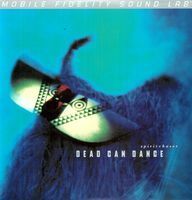 Mastered on Mobile Fidelity's world-renowned mastering system and pressed at RTI (America's best pressing plant), this pristine vinyl version presents Dead Can Dance’s farewell statement in stunning detail. Recorded at Quivvy Church in Ireland, Perry’s home studio, every note floats and naturally decays, voices carry, guitars shimmer, and the percussive imaging is focused and constant. You’ve never heard Dead Can Dance sound this good! The intricacies that have been uncovered will pull you in as if you’re in the studio.